AquaCircle er dansk 'spejl' af European Aquaculture Technology & Innovation Platform. Recirculated aquaculture system (RAS) is not restricted to fancy indoor facilities with concrete tanks. This is a VIDATEC RAS shrimpfarm under construction in Vietnam. The system consist of a raceway-system for nursing the post-larvae and grow-out ponds. The nursery and two grow-out ponds will be covered whereas two grow-out ponds will be in the open. All ponds will be lined and moving-bed biofilters will convert ammonia to nitrate, fixed-bed biofilters will collect particles (organic matter) - thus the water is constantly treated to secure optimal conditions for the shrimp. The very little new water needed is pumped from a sedimentation pond to a treatment station with filters, UV and ozone treatment - to eliminate/reduce the risk of introducing pathogens and parasites. Brazil has great opportunities for expansion of aquaculture. The many rivers host a lot of fish - of which only a small number has been domesticated. The picture show the entrance to a hatchery. Fully recirculated trout farm in Denmark (FREA). Perculated rainwater is catched in drainage-pipes. 5 kilometers of these has been digged in 5 meters depth. The small amount of water - mainly origin from dewatered sludge - is led out on the same sandy soil to perculate for later reuse - a natural recirculated system. Picture showing some indoor raceways with fingerling-trout. Construction of a raceway-system in Vietnam - for farming Pangasius in an intensive but sustainable way. Low feed conversion rate, better growth-rate, lower mortality and no use of chemical - this is the ambition. The system was stocked in february 2016 and a growth period to reach harvest-sized fish (1 kg) is expected to be 4-6 month. Some times simple solutions work very nicely. Picture showing the last step of treatment of the outlet-water from a salmon smolt facility in Chile. The reject water from sludge dewatering is spread out on the top of a bed filled with wood-chips and earth-worms. The worms consumes the bacteria and finally the wood has been composted and can be used as soil-improvement. The facility is covered to protect the worms from predatory birds! AquaCircle conference in Brazil with more than 200 participants - learning about RAS (Recirculated Aquaculture System) - pro's and con's. AquaCircle visiting Soichiro Hayashi - the biggest trout-farmer in Japan. 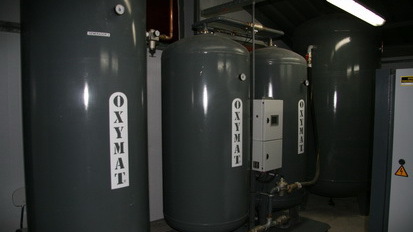 Do it yourself: Production of pure Oxygen - on site - always available. ....for farming warm freshwater species - like catfish and tilapia.